“The Spirit of the Lord is upon me, because he has anointed me to preach good news to the poor. He has sent me to proclaim release to the captives and recovering of sight to the blind, to set at liberty those who are oppressed, to proclaim the acceptable year of the Lord. And he closed the book, and gave it back to the attendant, and sat down; and the eyes of all in the synagogue were fixed on him. 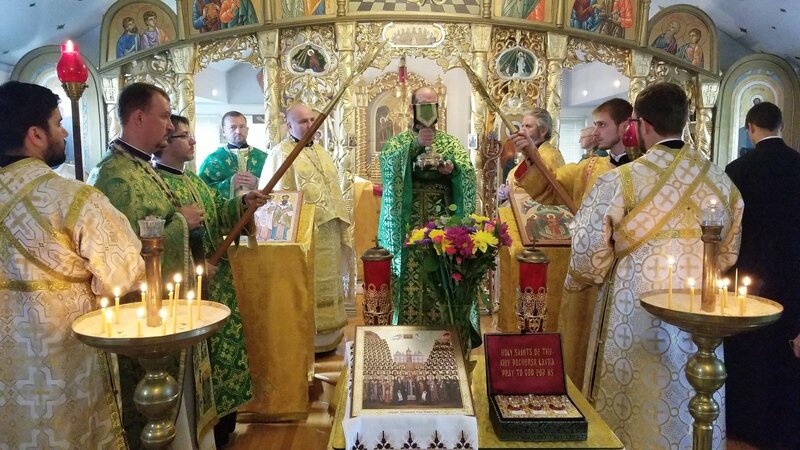 And he began to say to them, "Today this scripture has been fulfilled in your hearing" (Luke 4:18-21). Tradition also holds that it was during the month of September that the Hebrews entered the promised land with the blowing of trumpets. 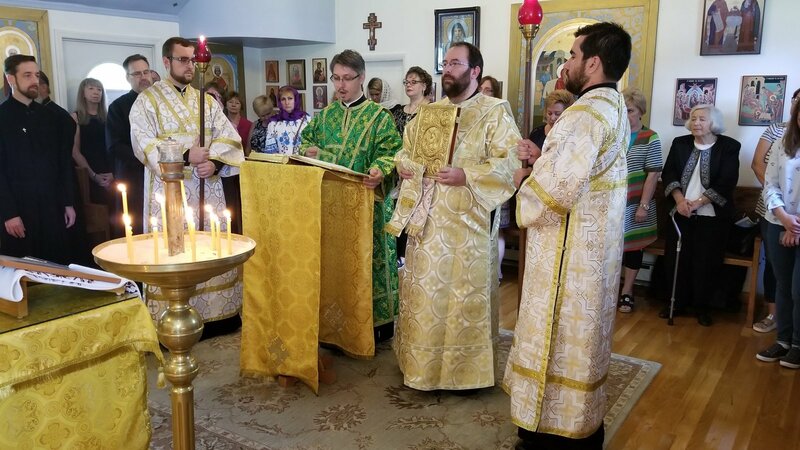 On this date, September 14 (September 1) the Orthodox Church initiates the Ecclesiastical New Year, which ends the following year on September 13 (August 31). 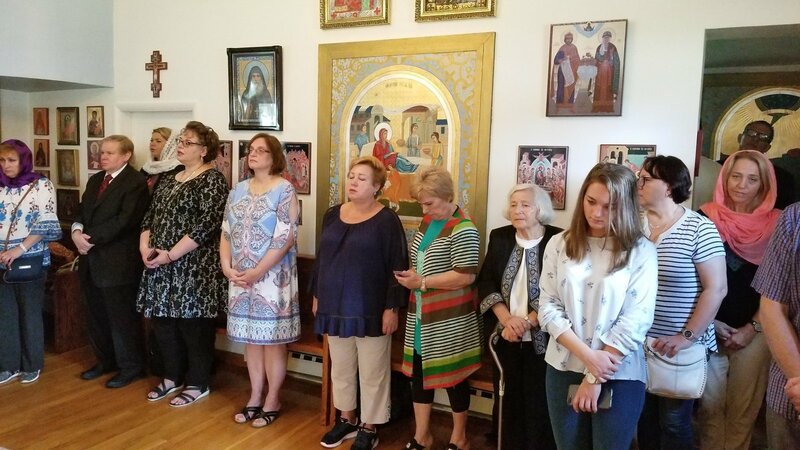 The first Great Feast of each Ecclesiastical Year is the Nativity of the Mother of God, celebrated on September 21 (September 8), and the last Great Feast day of the Ecclesiastical Year is the Dormition of the Mother of God on August 28 (August 15). 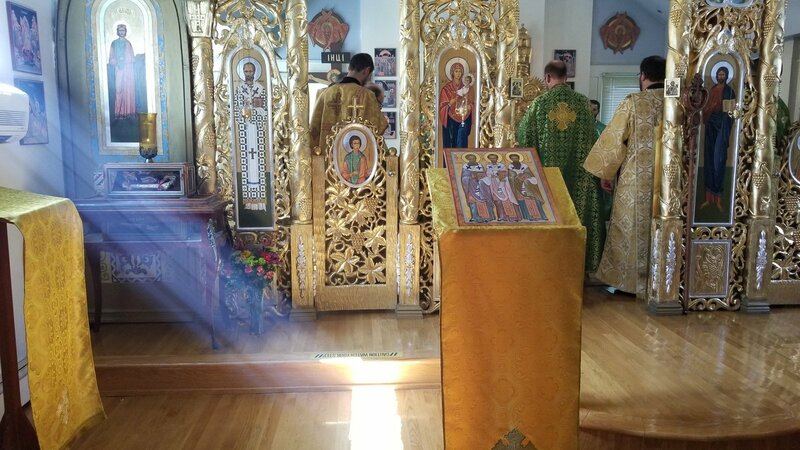 Saturday, September 15th, with the sun shining brightly through trees that were just starting to change to their autumnal colors, the faithful once again converged on South Bound Brook, NJ, arriving early at the St. Sophia Ukrainian Orthodox Theological Seminary to not only celebrate the Church New Year, but, also to celebrate the opening of the new Academic Year at the seminary, which currently has approximately 30 students registered to the various programs. 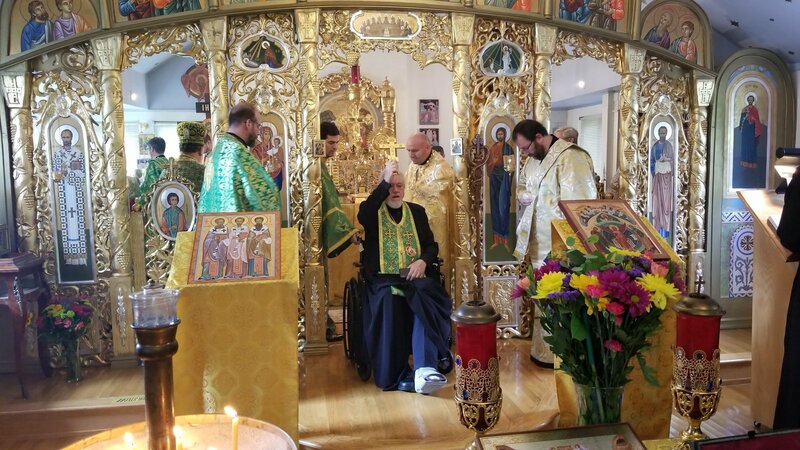 As everyone gathered in the Three Hierarchs Seminary Chapel, they were overjoyed to see the arrival of His Eminence Metropolitan Antony, who was still wheelchair-bound as he recuperates from a recent automobile accident. 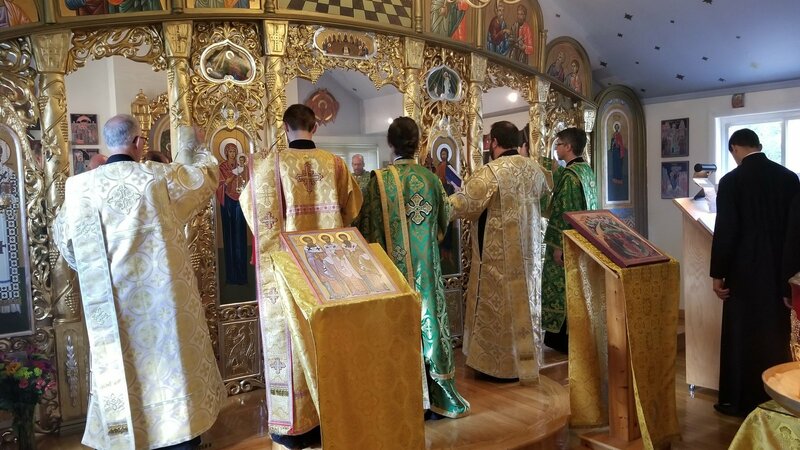 The Divine Liturgy flowed on angels’ wings as Metropolitan Antony, Rector of the Seminary, 8 clergy, 4 deacons, and scores of faithful put worldly cares aside and glorified our Lord and Savior. 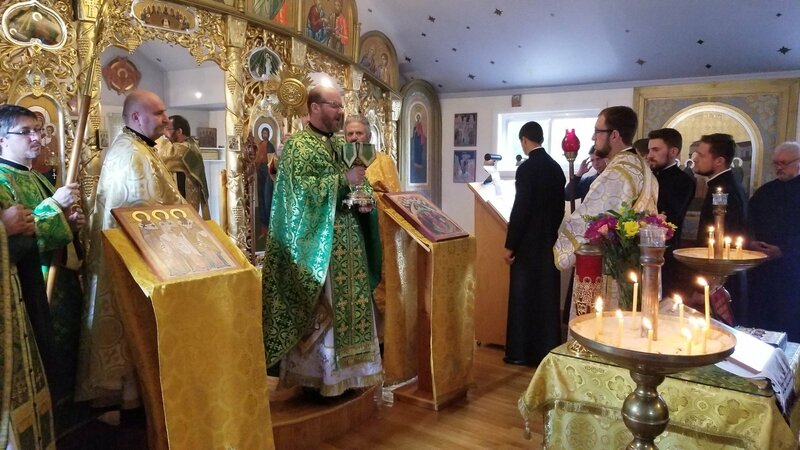 The Reading was from the Gospel of Matthew (Matthew 24:34-44), with the Lord assuring His followers that “Heaven and earth will pass away, but, My words will by no means pass away.” Very Rev. 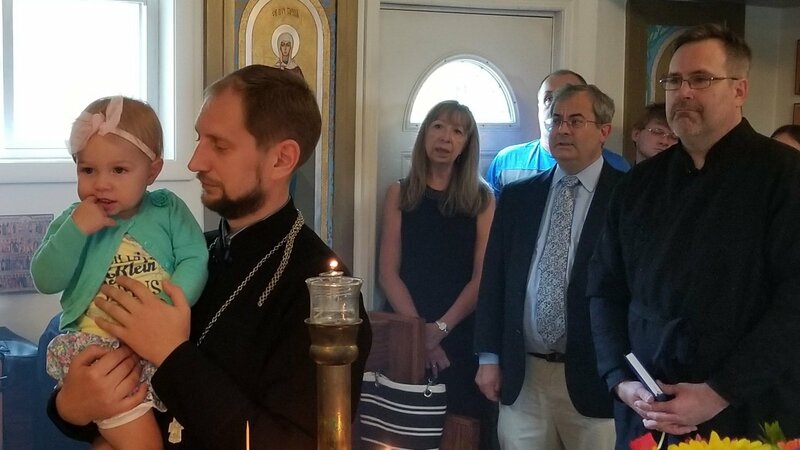 Anthony Perkins, Seminary Director of Vocations and Distance Learning, pastor of the Protection of the Theotokos Cathedral in Allentown, PA, gave the sermon commenting on the current tribulations attacking the Ukrainian Church. He suggested that everyone go back to the “basics”, keep their peace and not respond to evil with evil. 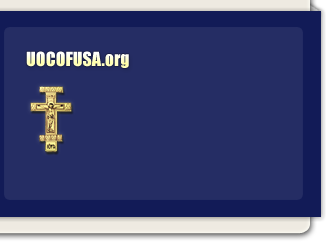 We should rededicate ourselves to prayer, finding God’s peace and sharing it with the world. During this time, we can justify our responses on Social Media, however, what is it that the moment truly requires of us? 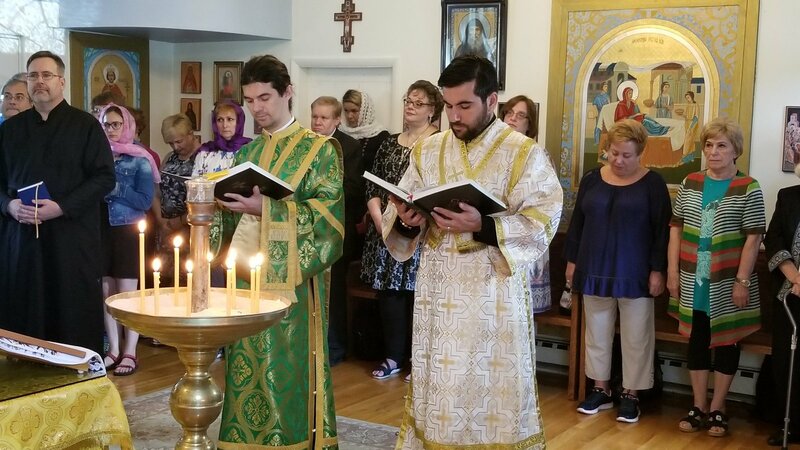 As St. Paul reminds us we can eat what we want, however, the standard is not whether it is useful for us, but, whether it is useful for our neighbor. The requirement always is that which will bring the Gospel, the Light of Christ, to the person who is listening or reading our words. We must display patience and love, and not always argue the canons and state historic precedence. We are Christians, grounded on the solid rock of Christ. Nobody can pull us from our joy or peace, unless we allow it. It is for us, to bring those falling in the midst of current chaos back to the salvation found on that solid rock. 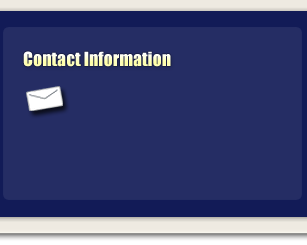 Following Fr. Anthony, Rev. 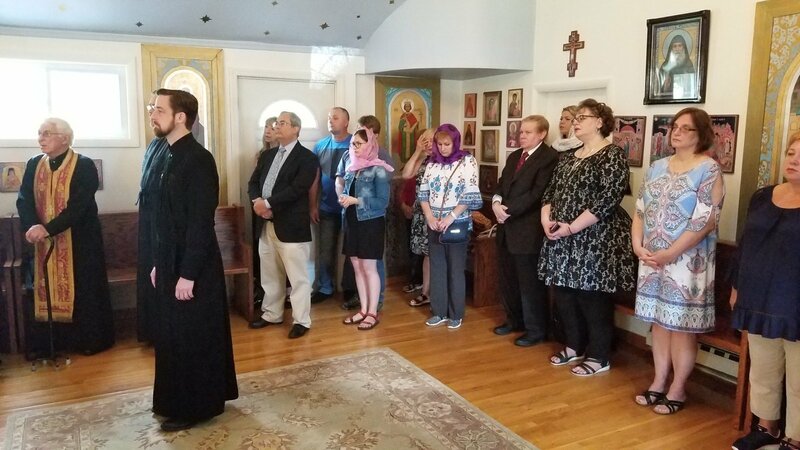 Vasyl Pasakas, Seminary Dean of Students and pastor of the Nativity of the Blessed Virgin parish, in South Plainfield, NJ, spoke about Sts. 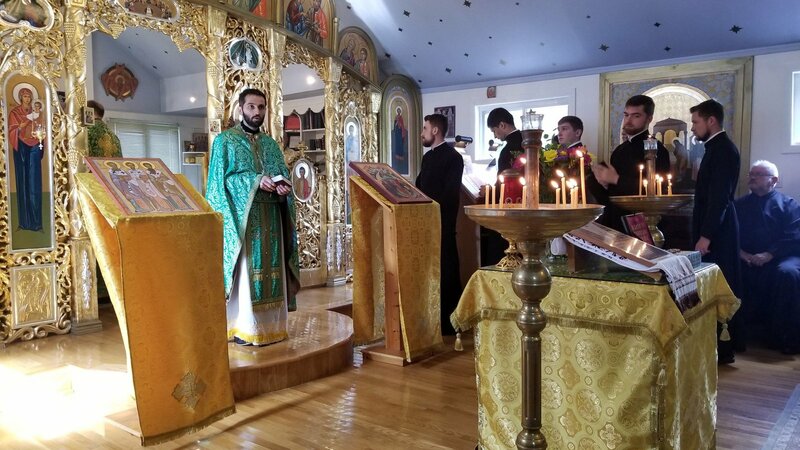 Anthony and Theodosius of the Kyiv Caves, who were commemorated on this day, and whose relics lay before the faithful for veneration. 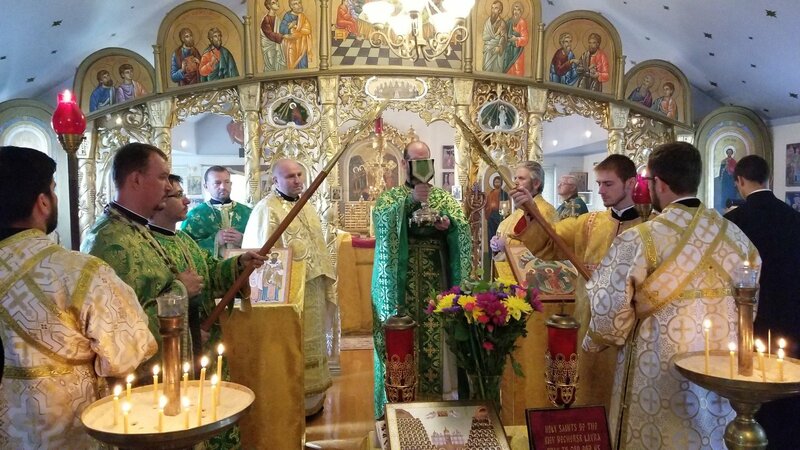 He explained how St. Anthony sought the Lord traveling to Mt. 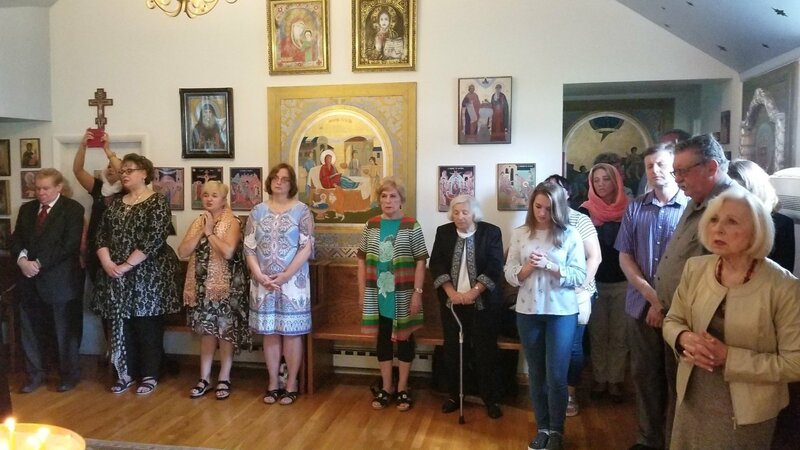 Athos, and then being sent back to Kyiv, the land of his birth, had wandered and visited various monasteries in search of the ascetism that would allow him to come nearer to God. 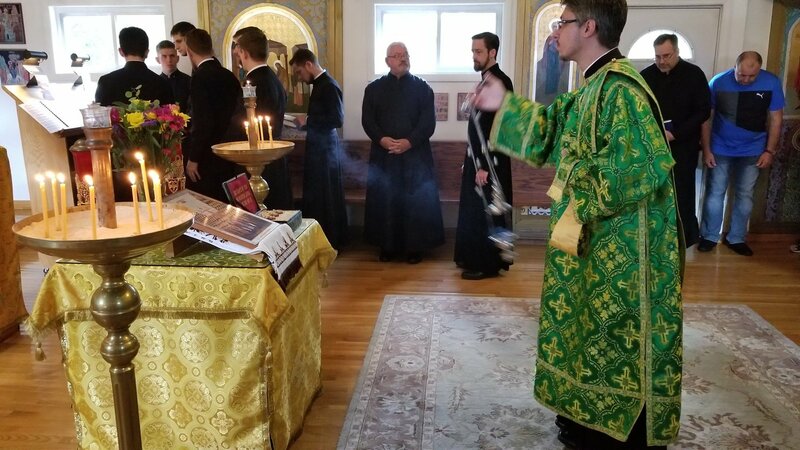 Not finding what he sought he traveled among the hills of Kyiv, finding a cave and settling there to pray and worship the Lord. 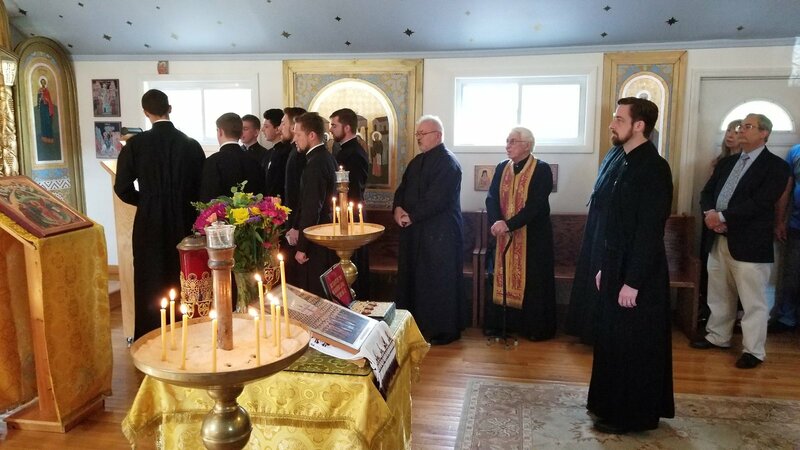 While he sought solitude, his ascetism and dedication to Christ, caught the attention of others, and soon monastics sought him out and joined him, eventually building a monastery on the site. Fr. 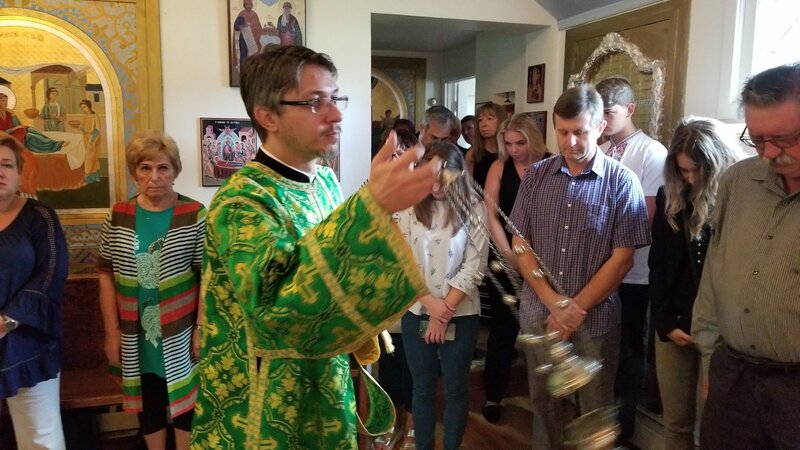 Vasyl explained that what we as Christians should seek is not fame and fortune, but, a nearness to God, and through our efforts, others will be saved. 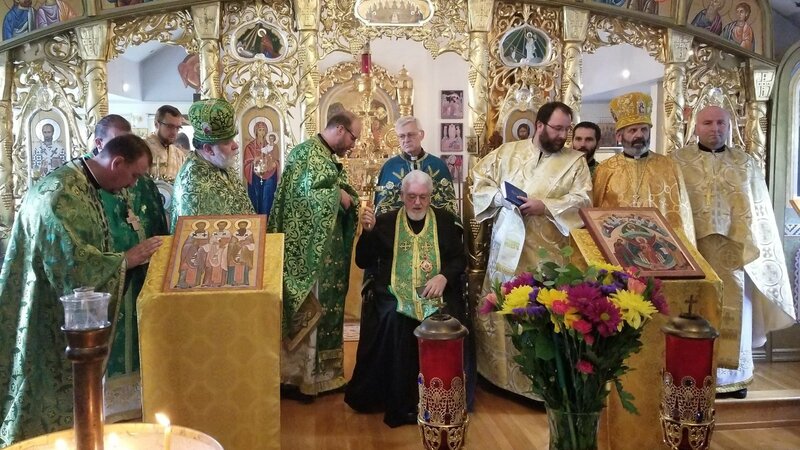 As the Divine Liturgy continued the clergy and faithful fervently prayed for His Eminence Archbishop Daniel, who was sorely missed by his flock. 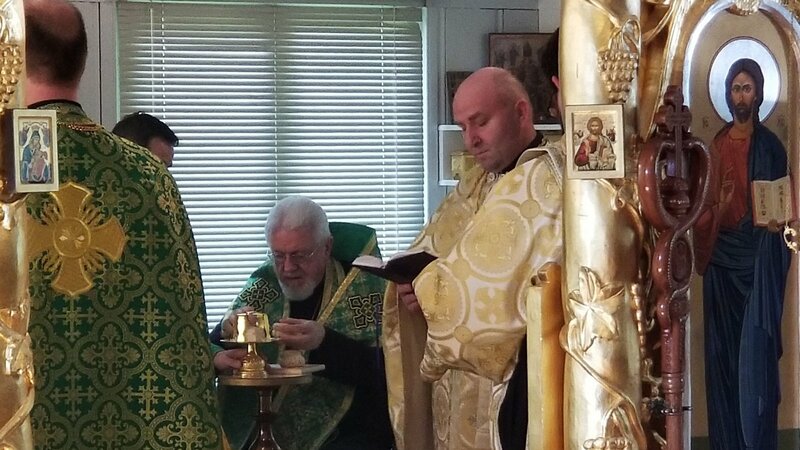 On this day, His Eminence was fulfilling his role as Exarch of the Ecumenical Patriarch, His All Holiness Patriarch Bartholomew, in Ukraine, in establishing a unified Ukrainian Orthodox Church – much like St. Anthony, brining salvation and the Light of Christ to the hills of Kyiv, for the salvation of countless souls. 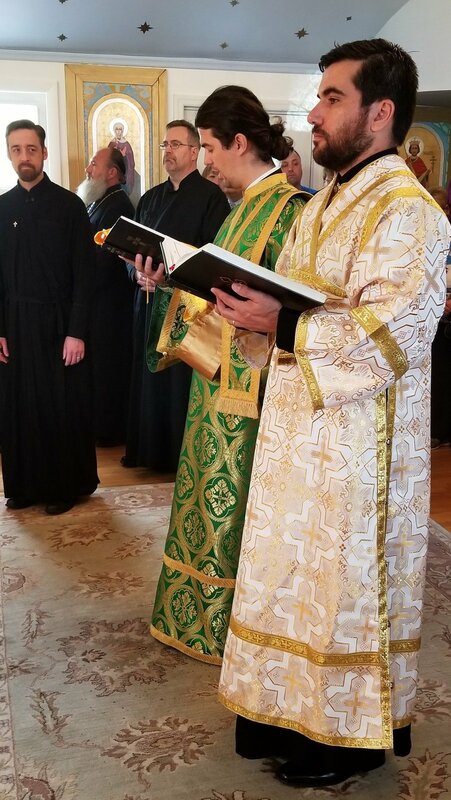 Upon the conclusion of the Divine Liturgy, His Eminence Metropolitan Antony took a moment to share a few pearls of wisdom with his flock, referencing the day’s Epistle Reading – 1 Corinthians 10:23-28, quoting: “Let no one seek his own, but each one the other’s well-being; and Galatians 5:22-6:2: “…if we live in the Spirit, let us also walk in the Spirit. Let us not become conceited, provoking one another, envying one another. 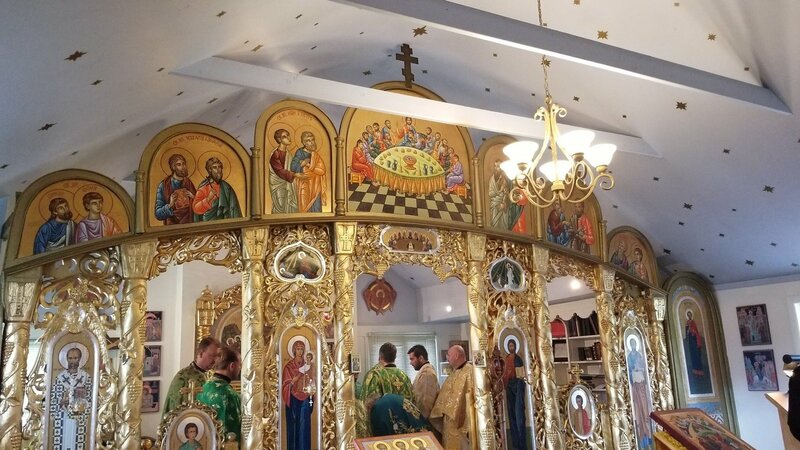 Brethren, if a man is overtaken in any trespass, you who are spiritual restore such a one in a spirit of gentleness, considering yourself lest you also be tempted. 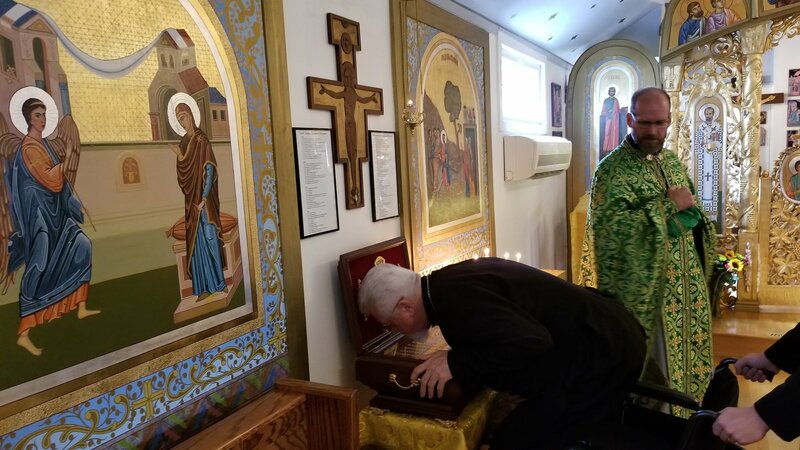 Bear one another’s burdens, and so fulfill the law of Christ.” His Eminence instructed us all to pray for peace, care for one another and do no harm to anyone else. In this time of tribulation, we are called to be the point of peace. He directed us to always think of the other person, their comfort, their needs, before ever thinking of our own interests. We are here to serve, as the Lord served. 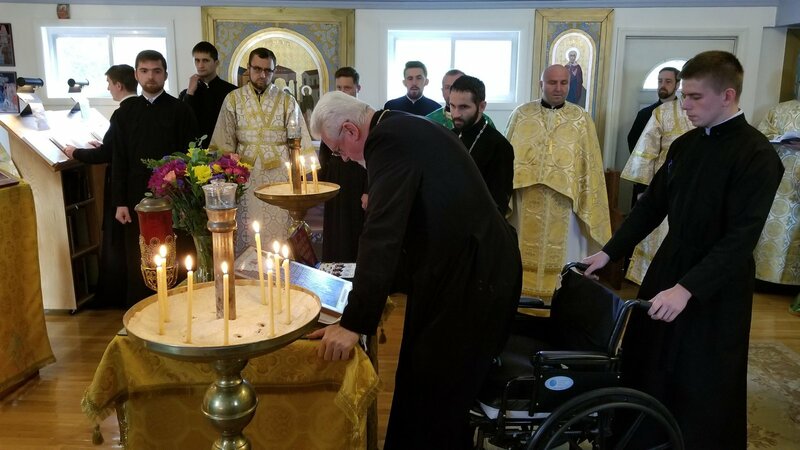 His Eminence recalled the time the Lord had been healing the multitudes, expelling demons, granting sight to the blind, straightening limbs, feeding souls and nourishing bodies. By the end of the day, He felt drained, just as He felt when the woman with the issue of blood touched the hem of His robe and was cured. Yet, the Lord always went where He would be able to do the most good, serve the most people, save the most lives, and bring salvation to the lost. Therefore, we who are His followers, cannot do any less than He did Himself. 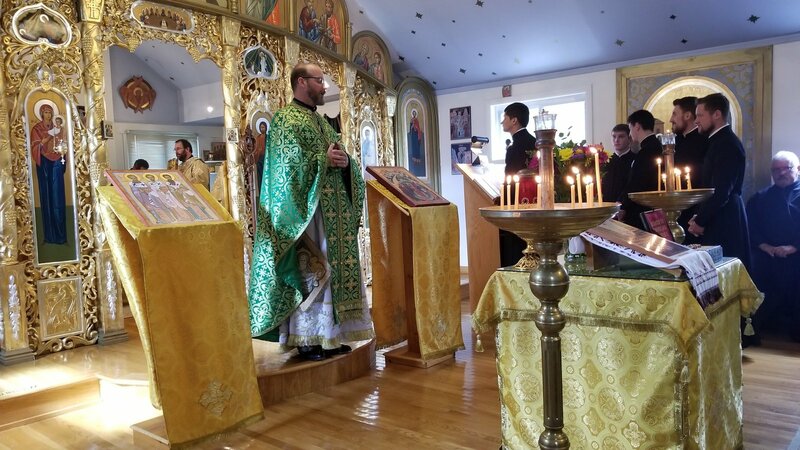 Vladyka beseeched us all to go forth in peace, and selflessness, and to bear each other’s burdens, spread the love of Christ, and not be the point of contention in this world which is already teetering on the brink. 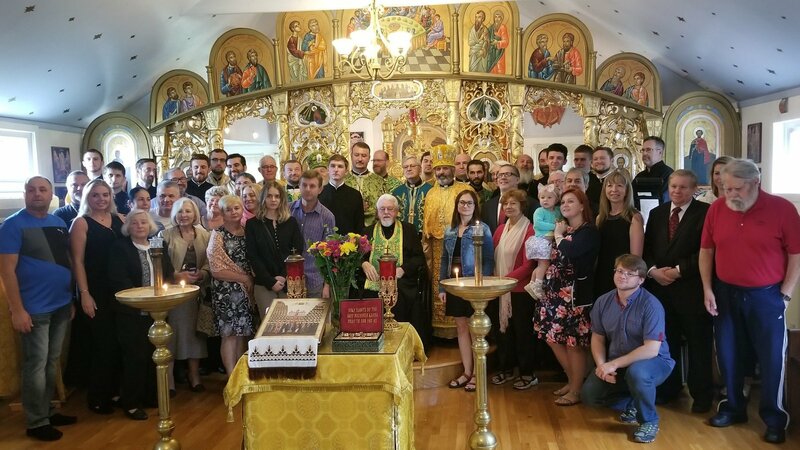 Having shared this deep wisdom with the faithful, His Eminence took a moment to give his blessing to all present, wishing the seminarians a successful academic year, and specifically acknowledging Father Deacon Ivan Tchopko who had celebrated a birthday that week. 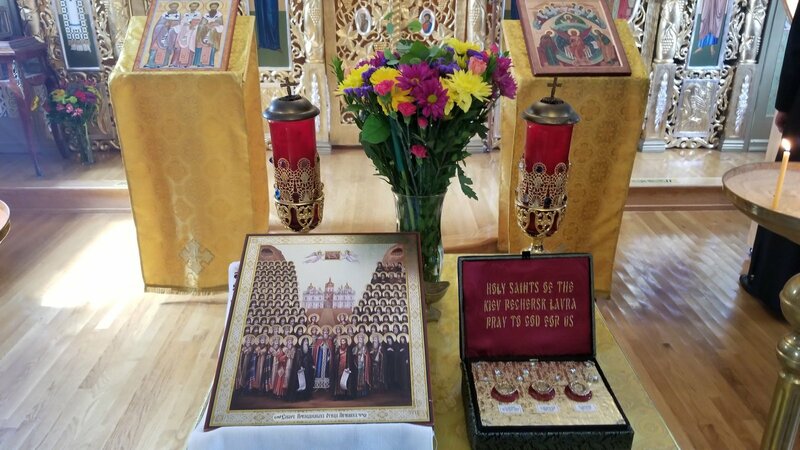 As the faithful came up to venerate the Cross offered them by His Eminence, they also were availed the opportunity to venerate the relics of Sts. 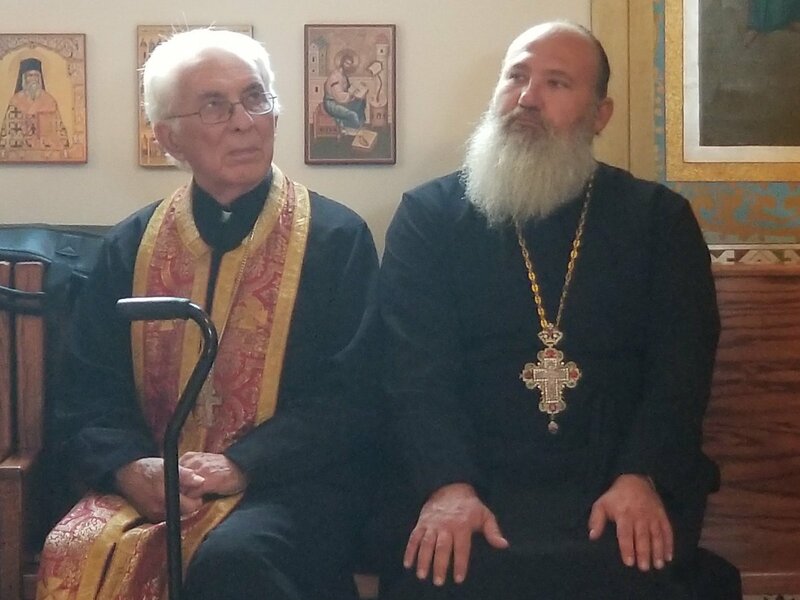 Anthony and Theodosius, the founders of monasticism in Ukraine. 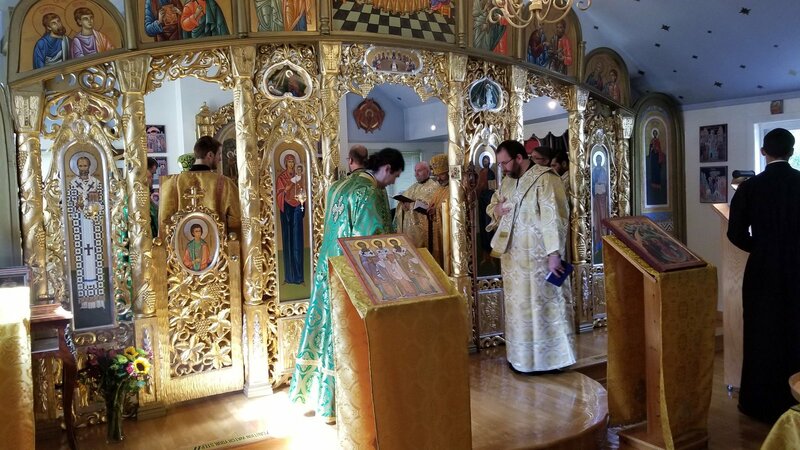 Nearing the doors, the scent of heavenly incense, that had nourished the soul in prayer, began to mingle with the scent that would now nourish the body. Slowly everyone exited the chapel, and made their way outside to enjoy a barbeque lunch prepared and donated by V. Rev. 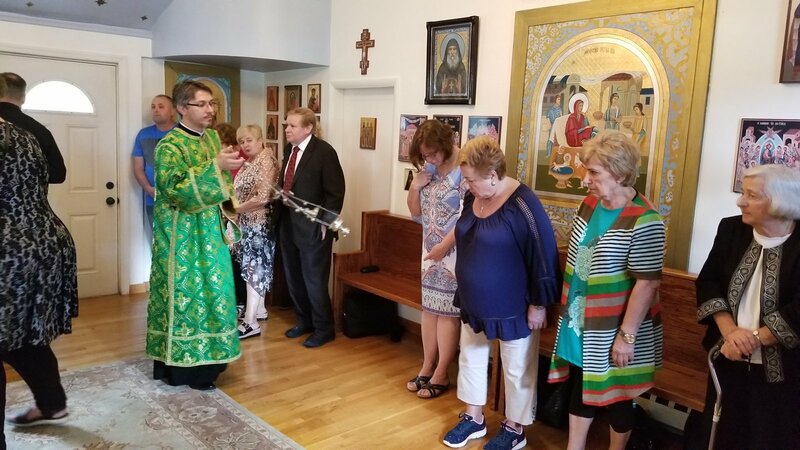 Vitaliy Pavlykivskiy and the parishioners of All Saints Parish, New York, NY. Laughter mingled with the smoke from the grilled shashlik, spreading across the grounds and rising through the trees, which sheltered the faithful from the sun, as they enjoyed the delicious meal, camaraderie, meeting with friends, getting acquainted with the seminarians, and enjoying the each other’s company. May this positive beginning to the New Year be a harbinger of the peace, joy and success to be realized throughout the coming year.